There are two kinds of object copying: shallow copies and deep copies. The normal copy is a shallow copy that produces a new collection that shares ownership of the objects with the original. Deep copies create new objects from the originals and add those to the new collection. This difference is illustrated by Figure 1. There are a number of ways to make a shallow copy of a collection. When you create a shallow copy, the objects in the original collection are sent a retain message and the pointers are copied to the new collection. Listing 1 shows some of the ways to create a new collection using a shallow copy. These techniques are not restricted to the collections shown. For example, you can copy a set with the copyWithZone: method—or the mutableCopyWithZone: method—or an array with initWithArray:copyItems: method. There are two ways to make deep copies of a collection. You can use the collection’s equivalent of initWithArray:copyItems: with YES as the second parameter. If you create a deep copy of a collection in this way, each object in the collection is sent a copyWithZone: message. If the objects in the collection have adopted the NSCopying protocol, the objects are deeply copied to the new collection, which is then the sole owner of the copied objects. If the objects do not adopt the NSCopying protocol, attempting to copy them in such a way results in a runtime error. However, copyWithZone: produces a shallow copy. This kind of copy is only capable of producing a one-level-deep copy. If you only need a one-level-deep copy, you can explicitly call for one as in Listing 2. This technique applies to the other collections as well. Use the collection’s equivalent of initWithArray:copyItems: with YES as the second parameter. 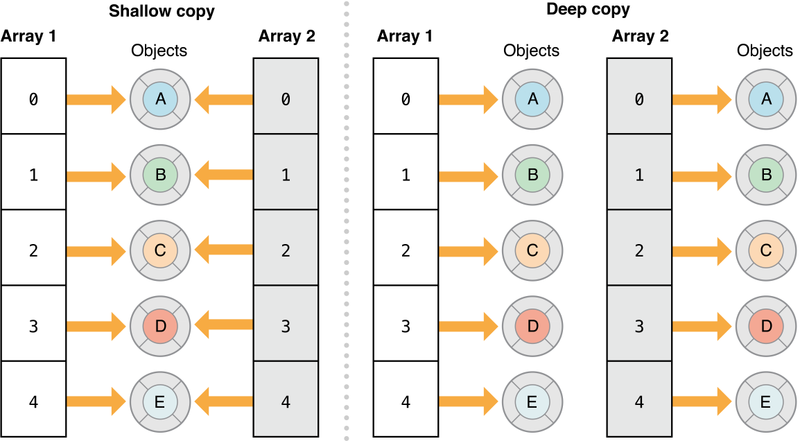 If you need a true deep copy, such as when you have an array of arrays, you can archive and then unarchive the collection, provided the contents all conform to the NSCoding protocol. An example of this technique is shown in Listing 3.
copyWithZone: makes the surface level immutable. All deeper levels have the mutability they previously had. initWithArray:copyItems: with NO as the second parameter gives the surface level the mutability of the class it is allocated as. All deeper levels have the mutability they previously had. initWithArray:copyItems: with YES as the second parameter gives the surface level the mutability of the class it is allocated as. The next level is immutable, and all deeper levels have the mutability they previously had. Archiving and unarchiving the collection leaves the mutability of all levels as it was before.